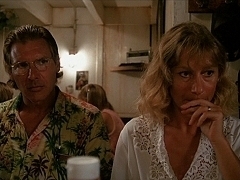 Allie (Harrison Ford) goes missing in the water, which leads to a breakdown by his wife (Helen Mirren) on board. 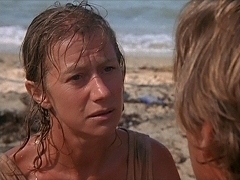 When the family reaches the beach, Mother (Helen Mirren) tries to convince Allie (Harrison Ford) to stay at this place. On board to Belize, Allie (Harrison Ford) meets Reverend Spellgood (Andre Gregory) and his family. 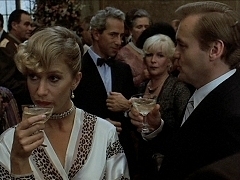 Ruth (Helen Mirren) is appalled by the current media attention surrounding Vic (Toni Conti). 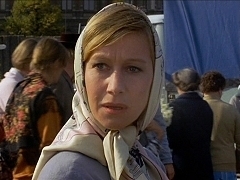 As Vic (Tom Conti) tries to repeat his miraculous jump, Ruth (Helen Mirren) tries to convince him to stop looking for miracles. After a rather unpleasent meeting at the principal's office, Vic (Tom Conti) waits for Ruth (Helen Mirren) outside the church to talk to her. Press junket interview with Helen Mirren for "Heavenly Pursuits", in which she discusses turning down the female lead in "Straw Dogs". 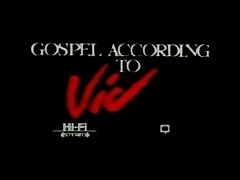 International trailer for Heavenly Pursuits, which was re-titled Gospel According to Vic. 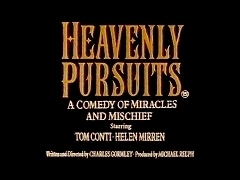 Theatrical trailer for Heavenly Pursuits. Excerpt from White Nights, directed by Taylor Hackford, starring Mikhail Baryshnikov and Helen Mirren. Excerpt from the 2004 documentary Pas De Deux: Making White Nights, featuring interviews with Taylor Hackford, Helen Mirren and Isabella Rosselini. Helen Mirren is interviewed by Brian Linehan during a segment of City Lights to promote the theatrical release of White Nights. Television spot for White Nights, directed by Taylor Hakford and starring Mikhail Baryshnikov, Gregory Hines, Helen Mirren and Geraldine Page. 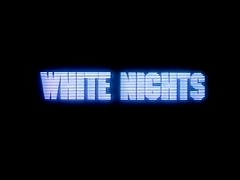 Theatrical trailer for White Nights, directed by Taylor Hakford and starring Mikhail Baryshnikov, Gregory Hines, Helen Mirren and Geraldine Page. The husband (Jeffrey Tambor) can't believe to find a strange woman in his house, pretending to be his dead wife. 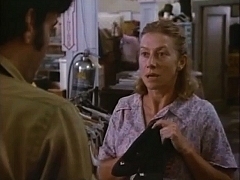 Maddie Duncan (Helen Mirren) is having a hard time pleasing customers at the thrift store she's working at. May 1985. 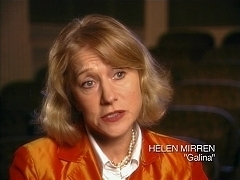 Helen Mirren visits Terry Wogan's talkshow to talk about her life and career, during which she loses her pearls, much to her own and the audience's delight. 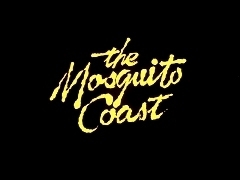 Television spot for "The Mosquito Coast", directed by Peter Weir and starring Harrison Ford and Helen Mirren. Theatrical trailer for "The Mosquito Coast", directed by Peter Weir and starring Harrison Ford and Helen Mirren.